"Autostrada" redirects here. For other uses, see Autostrada (disambiguation). For the company previously known as Autostrade, see Atlantia (company). The Autostrade (Italian: [autoˈstraːde]; singular autostrada [autoˈstraːda]) are roads forming the Italian national system of motorways. The total length of the system is about 6,758 kilometres (4,199 mi). In North and Central Italy, the Autostrade mainly consists of tollways managed by Atlantia S.p.A. (formerly Autostrade S.p.A.), a holding company controlled by the Benetton family. Other operators include ASTM, ATP, and Autostrade Lombarde in the north-west; Autostrada del Brennero, A4 Holding, Concessioni Autostradali Venete, and Autovie Venete in the north-east; Strada dei Parchi, SALT, SAT, and Autocisa in the center; and CAS in the south all under the supervision of the state-owned ANAS. Italy became the first country to inaugurate motorways reserved for motor vehicles with A1. The Milano-Laghi motorway (connecting Milan to Varese) was devised by Piero Puricelli, a civil engineer and entrepreneur. He received the first authorization to build a public-utility fast road in 1921, and completed the construction (one lane each direction) between 1924 and 1926. By the end of the 1930s, over 400 kilometers of multi- and dual-single-lane motorways were constructed throughout Italy, linking cities and rural towns. Italy's autostrade have a standard speed limit of 130 km/h (81 mph) for cars. Limits for other vehicles (or during foul weather and/or low visibility) are lower. Legal provisions allow operators to set the limit to 150 km/h (93 mph) on their concessions on a voluntary basis if the following conditions are met: three lanes in each direction and a working SICVE, or Safety Tutor, speed-camera system that measure the average speed. In 2016, no road was utilizing this possibility. The first speed limit, to 120 km/h (75 mph), was enacted in November 1973 as a result of the 1973 oil crisis. In October 1977, a graduated system was introduced: cars of above 1,300 cc (79 cu in) had a 140 km/h (87 mph) speed limit, cars of 900-1299 cc had a limit of 130 km/h (81 mph), those of 600-899 cc could drive at 110 km/h (68 mph), and those of 599 cc (36.6 cu in) or less had a maximum speed of 90 km/h (56 mph). In July 1988 a blanket speed limit of 110 km/h (68 mph) was imposed on all cars above 600 cc (the lower limit was kept for smaller cars) by the short lived PSDI government. In September 1989 this was increased to 130 km/h (81 mph) for cars above 1,100 cc (67 cu in) and 110 km/h (68 mph) for smaller ones. (A2 – designation has been replaced - formerly Rome - Naples, now part of A1). A12 Genoa - Rosignano Marittimo / Tarquinia - Rome (known as "Autostrada Azzurra", Blue Motorway), comprising two separate parts but connected by Strada Statale 1, "via Aurelia", between Rosignano and Tarquinia. Until 1990, the designation A1 referred only to the Milan-Rome section of the current A1; the Rome-Naples section was known as A2. After a link was built bypassing Rome, the designation A2 was withdrawn and now the A1 designation refers to the whole route. The residual connections to the "Grande Raccordo Anulare" (Great Ring Road, around Rome) were designated as raccordi (see later). Until 1973, the designation A17 referred to the current A16, and the section Canosa-Bari of the current A14. This is a list of tangenziali classified as autostrada. Some autostrade are called bretelle, diramazioni or raccordi because they are short and have few exits. Bretelle, diramazioni or raccordi are generally connections between two motorways, or connections between motorways and important cities without a motorway. They have the same number (sometimes with the suffix dir) as one of the two autostrade linked, a combination of the numbers of the two autostrade linked, or the number of the main autostrada. Important alpine tunnels ((in Italian) trafori) are identified by the capital letter "T" followed by a single digit number. Currently there are only three T-classified tunnels: Mont Blanc Tunnel (T1), Great St Bernard Tunnel (T2) and Frejus Road Tunnel (T4). Tunnels that cross the border between Italy and France (T1, T4) or Switzerland (T2), are treated as motorways (green signage, access control, and so on), although they are not proper motorways. The code T3 was once assigned to the Bargagli-Ferriere Tunnel in Ligurian Appennines before it was reclassified as SP 226. 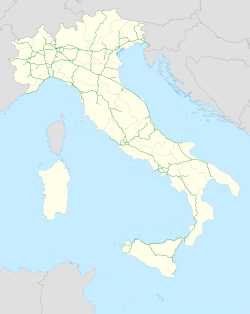 RA stands for Raccordo autostradale (translated as "motorway connection"), a relatively short spur route that connects an autostrada to a nearby city or tourist resort not directly served by the motorway. These spurs are owned and managed by ANAS (with some exceptions, such as the RA7 that became A53 when assigned to a private company for maintenance). Some spurs are toll-free motorways (type-A), but most are type-B or type-C roads. All RA have separate carriageways with two lanes in each direction. Generally, they do not have an emergency lane. Type B highway (or strada extraurbana principale), commonly but unofficially known as superstrada (Italian equivalent for expressway), is a divided highway with at least two lanes in each direction, paved shoulder on the right, no cross-traffic and no at-grade intersections. Access restrictions on such highways are exactly the same as autostrade. Signage at the beginning and the end of the highways is the same, except the background color is blue instead of green. The general speed limit on strade extraurbane principali is 110 km/h. Strade extraurbane principali are not tolled. All strade extraurbane principali are owned and managed by ANAS, and directly controlled by the Italian government or by the regions. ^ Novella de Luca, Maria (1989-09-28). "'Via libera ai 130 km/h' la camera aumenta i limiti di velocità" [Green light for 130 km/h: chamber increases speed limits]. La Repubblica (in Italian). Retrieved 2017-01-18.